UNSW scientists have made a great stride towards developing a blueprint to make a large-scale quantum computer. UNSW researchers at the Centre of Excellence for Quantum Computation and Communication Technology (CQC2T) have developed a pioneering single atom technology that can be adapted to building 3D silicon quantum chips. 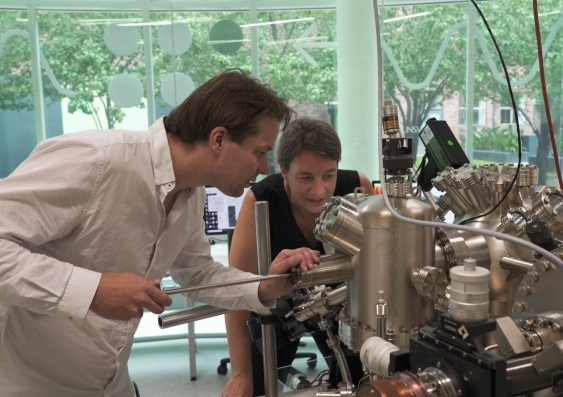 Led by 2018 Australian of the Year and Director of CQC2T Professor Michelle Simmons, the researchers have shown for the first time that they can build atomic precision qubits in a 3D device – another major step towards a universal quantum computer. The team was able to extend their atomic qubit fabrication technique to multiple layers of a silicon crystal, thus demonstrating the feasibility of an architecture that uses atomic-scale qubits aligned to control lines – which are essentially very narrow wires – inside a 3D design. Professor Simmons, which is also the founder and a director of Australia’s first quantum computing company, Silicon Quantum Computing (SQC), said team members were able to align the different layers in their 3D device with nanometer precision – and showed they could read out qubit states with what’s called ‘single shot’, i.e. within one single measurement, with very high fidelity. “This 3D device architecture is a significant advancement for atomic qubits in silicon,” Professor Simmons said. “To be able to constantly correct for errors in quantum calculations – an important milestone in our field – you have to be able to control many qubits in parallel. The research, which was published in Nature Nanotechnology, demonstrates how to build a second control plane or layer on top of the first layer of qubits. “It’s a highly complicated process, but in very simple terms, we built the first plane, and then optimised a technique to grow the second layer without impacting the structures in first layer,” explained CQC2T researcher and co-author, Dr Joris Keizer. He also explained how the team managed to align these multiple layers with nanometer precision, and to measure the qubit output of the 3D device with a single, accurate measurement, rather than having to rely on averaging out millions of experiments. “If you write something on the first silicon layer and then put a silicon layer on top, you still need to identify your location to align components on both layers. We have shown a technique that can achieve alignment within under five nanometers, which is quite extraordinary,” Dr Keizer continued. Professor Simmons, whose company is working to create and commercialise a quantum computer based on a suite of intellectual property developed at CQC2T and its own proprietary intellectual property, said the research is slowly edging towards perfecting a large-scale architecture that will lead to the eventual commercialisation of the technology. “This is an important development in the field of quantum computing, but it’s also quite exciting for SQC,” the Professor stated.